Personalized Desk Memo Pad Holders -Custom Leather Imitation Padded Note Holders in Bulk. Promotional, Inexpensive. Very attractive bulk note (memo) holders made of padded faux leather (leatherette). 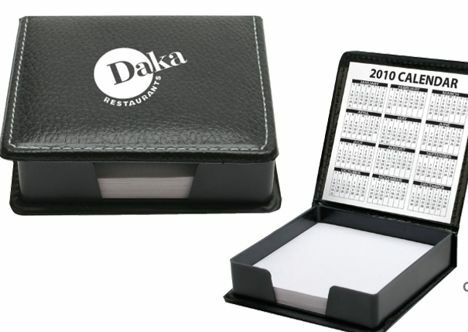 Our padded flip top note holders a 3"x3" note pad and a calendar. Replacement sheets are available: contact us. Budget Prices in USA and Canada for wholesale padded memo pad holders. American clients pay no taxes. Great gift to doctors, clergy, executives, etc. Basic unit prices include your 1-color custom imprint. Add $0.40 per memo pad holder for each extra imprint color. Setup Charge: $45.00 per color; Re-order Setup Charge: $25.00 per color. Production: 7-10 days after art approval. Rush 3 day production is available: contact us. Padded leatherette (faux leather) cover. Packaging: Gift Box; 88 units per carton. 31 lbs per carton.